I have never been a huge fan of scallops. When I've eaten them they've usually been undercooked or overcooked. My feelings have changed. Although I don't eat them often, I have a new-found appreciation for them. The trick to cooking scallops is to have the fry-pan smoking hot. What I mean by this is that it should be giving off a tiny bit of smoke just before burning point. I usually use vegetable, canola or sunflower oil for these high temperatures. The pan should be lightly oiled and the oil itself should be swirling. Scallops only require very little time in the pan. Medium-sized scallops such as the ones pictured were cooked for 80 seconds: 40 seconds on each side and - this is important - turned only once. The high heat of the pan sears the outside of the scallop which helps to seal in the juices making the flesh firm yet tender. The glaze is a combination of caramelized sugar, orange juice and zest and soy sauce. If you've never caramelized sugar before, then be warned, it requires a little patience and constant attention. The result is worth it though and it only takes about 15 minutes. This particular glaze is also excellent with chicken, oily fish such as salmon and halibut or pork. Run the scallops under some cool water and then pat dry with a paper towel. Season them with a little sea salt. Zest the orange and then finely chop the zest. Squeeze the juice and remove the seeds. Combine the zest, concentrate and fresh juice with soy sauce and rice vinegar. Set aside. In a small, heavy-based pot, stir the water and sugar together. Bring to a boil and continue to cook until the sugar caramelizes. You will have to gradually turn the heat down as you cook. This process will take about 15 minutes. Every 3 minutes or so, dip a pastry brush in cool water and brush the insides of the pot. This helps to stop the sugar from hardening up the sides. Cook the mixture until just before burning point. You will see a little smoke. Remove pot from heat immediately. Place a sieve over the pot and pour the red wine into the caramel. Let it cool and add the zest, concentrate, fresh juice, soy sauce and vinegar. Stir to combine and then set aside. Heat the oil in a fry-pan over a medium-high heat until the oil starts to swirl and smoke very slightly. The pan has to be really hot to sear the scallops. Add the scallops and fry for 40 seconds on each side just once. Don't turn them multiple times. 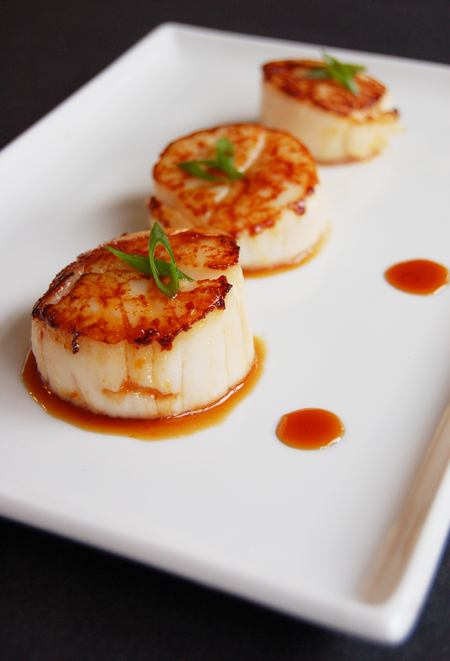 Place the scallops on a serving plate and then spoon on the orange soy sauce. Garnish with thin slivers of green onion. Ah, I have always loved scallops, from the first time I tasted one... And pictures like that are why I keep coming back for more! I have never successfully shopped for a fresh one, though... Always frozen, yikes. This picture makes me even more sad that I cannot find fresh scallops anywhere here in Cape Town....at least not yet. The glaze is awesome!!! I'm literally a seafood hog and this is going to my "to do" list...thanks! Those scallops really do look perfectly done! And the glaze would be just right with it too. They do look perfect! I adore scallops. Delicious. Perfectly cooked and a lovely glaze. This looks awesome! I think I can taste the glaze and feel the texture of the scallops. Will need to try that glaze soon. hello Syrie !!! it's Vincent the frenche cooker !!!! thank you for your comment on my blog. Congratulation for this wonderfull recipie, i love the scallops...i really want to eat my computer !! it looks simple and professional in the same time...great !!! When cooked right, I am a huge fan of scallops. I'm glad you have come around to liking them or at least giving them another try because your recipes looks magnificent! Syrie - this is a restaurant-worthy dish. I loooove scallops, they are the best, but some of the treated ones are not as good, anyway, I can eat them every meal! What a pretty, delicious looking recipe. Your picture is stunning. Tasty New England - Thanks for visiting! I was in your area recently and it's a gorgeous part of the world! Hey Manggy, give the frozen ones a try anyway! thanks for stopping by. You too Nina! Fresh scallops can be great as well and I usually use them if I can't get a hold of fresh ones. Thanks Amrita. Hope you enjoy them! Thanks for visiting Brilynn. This particular glaze is pretty versatile. Thanks Darlene, hope you enjoy it. The searing does make an excellent coating. No worries Vincent! Love your comments. They make me smile. Thanks so much Hillary. Yes they can be hit or miss depending on cooking. I'm also more of a fan of the medium to smaller ones. Oh Bee, you're the best! This looks like a great recipe - I bookmarked you at the http://www.tutable.com Social Bookmark website. Ha Irene, you're funny! Great story and thanks for sharing it. Thanks recipes, I really appreciate it! Wow! Excellent photos! Had to stop myself from taking a stab at it. These look fantastic! Great photos all around!